The weekend is one day away so if you are heading to Nha Trang, we have listed 5 things to do in Nha Trang. Nha Trang is known for it’s beaches and scuba diving sites and is a popular destination for both local and international tourists. While high rise hotels span the length of the main beach, the city still retains some of it’s local charm and if you are willing to head out of town, there are a few unspoilt beaches to be visit. While we’ve written in length about Nha Trang in our Discover Vietnam post, we’ve listed our top 5 things to do at the beach destination. Take the 3,320 metre gondola cable car to Hon Tre which is home to Vinpearl Land. This entertainment centre includes a water park, bumper cars along with an expansive food court and is enough entertainment for the whole day! Local insight: The cable car is the longest over the sea cable car in the world. There are a few spas dotted around town that offer relaxing spa treatments but for the ultimate in relaxation, head to Thap Ba Hot Springs for a hot mineral-mud bath. Local insight: They are a bit out of town so make sure you take a taxi there. The scuba diving is world-class and there are many different schools to choose from in the city. Just make sure you use a PADI certified school. Local insight: Rainbow Divers has been running for over 17 years and is the recommended choice in town. There are over 350 different species of coral and other marine life in the ocean off Nha Trang. So when you get your PADI, rent a boat and go diving! Local insight: Hon Mieu island’s clear water makes it a favourite for snorkellers and scuba divers alike. Located in Long Son Pagoda, this 80 metre long sleeping Buddha is one of the largest in the world. Inscriptions of the teachings of the lord Buddha dots the walls of the pagoda. Local insight: Make sure to take the 150 step staircase to the top. Stunning views of Nha Trang are your reward. 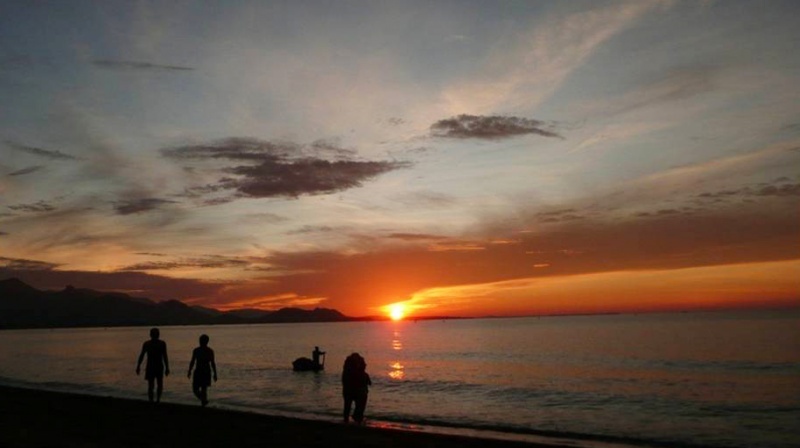 Have a great weekend and enjoy our 5 things to do in Nha Trang! The 21th Bay Nui ox-racing festival was held at the Khmer pagoda of Ta Miet, in the southern province of An Giang, on October 14, with 64 pairs of cows from southern provinces of Vietnam and Cambodia. In order to promote the solidarity of 54 ethnic minority groups, the festival is organized annually. This is a joyful activities in An Giang that visitors from all ages are fond of. During four-day event, visitors also have chance to enjoy the cultural identities in Vietnam. A muddy 120-meter-long racing path is the central point of the whole event where people gathered to witness the strongest and the fasted pairs to win the race. Before the cow racing festival, farmers had chosen the best pairs of cows for racing. The cowboy held the stick with sharp point when the race starts, he hitted the cows to make them run as fast as they can. The challenge is how to keep the pair run at the same speed and stay focused, otherwise he can probably fall down onto the race and get severe injury. The beach is the main attraction, and choosing the right place to stay is very important if your goal is to have quality beach time. The resorts have private beach rights allowing them to keep non-guests away from guests. It also motivates the resorts to keep their beach clean. However, only Bau Truc and Saigon Tourist-Ninh Chu do it consistently. Beaches in front of the other resorts can accumulate garbage from the locals who come to the bay in the morning and evenings. Waking up for sunrise is highly recommended and may be a highlight of your trip to Vietnam. Get to the beach before 5:30 AM with a towel to sit and watch what seems like the entire city of Phan Rang doing their daily exercising/socializing in front of a beautiful sunrise. You will also see many of the traditional round boats out in the bay as the fisherman collect their daily catch. The hundreds of locals mysteriously disappear around 8:00 AM and the beach is all yours until the evening. If you have traveled to other popular beach locations in Vietnam, you will notice im/mediately that nobody will come and try to sell you trinkets in Ninh Chu Bay. In fact, during the daytime you may not see anyone on the beach. If you love to wind surf or kite surf, then Ninh Chu Bay is a paradise. A consistent, strong wind begins blowing before noon and lasts until the evening. Jet skis and motorboats are still unknown, leaving just a few fishing boats as the competition. As of now, none of the resorts rent equipment, however. If you feel like exploring, behind the Saigon Tourist Hotel and within walking distance from the center of the bay, is a hill with several temples and pagodas. Pathways make it easy for visitors to walk up to the statues among the hills and look out over the area. It is a very peaceful place. 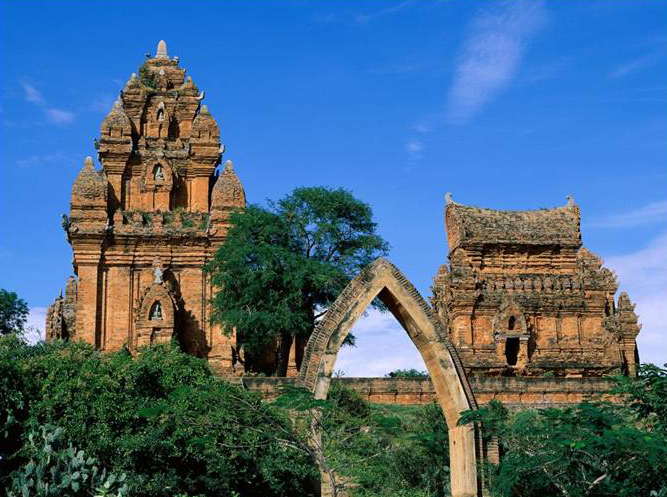 Thap Cham is the location of two of the most famous Cham temples. The most popular is Po Klong Garai, which was built in the 13th century and is still an active site for Cham celebrations. Unlike many old ruins, the government has recently renovated the attraction and it is kept in good shape. If you want to take a day trip, the most popular attraction for the Vietnamese tourists is near-by Vinh Hy Bay. Vinh Hy is a small fishing village about 30 kilometers north of Ninh Chu Bay. Your resort can arrange for you to catch a bus. Once in Vinh Hy, you can take a boat tour to some of the nearby islands and the deserted beaches of the Ninh Thuan coast. Before the new coastal highway was built, these beaches were only accessible by boat. Your dining options are fairly limited, but they are also pretty good. Of course Vietnamese style seafood is the main attraction. The Sakaya Restaurant at the Bau Truc Resort is highly recommended. The restaurant is open air and located on the beach, unlike many of the other resort dining options. The food is relatively inexpensive with most dishes being around $4 and a beer costing $1. Stick with the Vietnamese dishes and stay away from their attempts at western food. If your resort has a large group of loud Vietnamese tourists, then another excellent option is the beach bar at the Saigon Tourist-Ninh Chu Hotel. It is usually very quiet and you can order any of the dishes from the main restaurant. Phan Rang is also famous for its chicken and rice. The dish is fairly simple, just boiled chicken, rice, and a spicy fish sauce. You can find this dish in many of the local restaurants around Phan Rang. Phan Rang does not have any nightlife fitting for foreign tourists, yet. If bars and discos are your thing, then Nha Trang or Mui Ne are more appropriate locations. That doesn’t mean there is nothing to do at night, though. Check out 16 April Park to experience a side of Vietnam that not everybody sees. Hundreds of locals gather around the park to eat street food, drink beer, and chat. It is safe and you will be left alone to enjoy the cool evenings. The park is located between the beach and Phan Rang city. In general, it is not safe for foreigners to rent motorbikes in Vietnam. 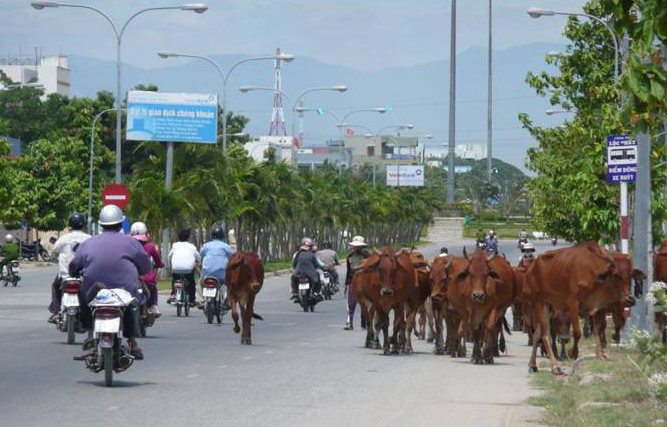 Phan Rang might be the exception, as the roads near the beach are wide and empty. Most resorts can rent one to you for about $7/day. We still recommend a taxi or bus if you plan on visiting the Cham Temples or Vinh Hy Bay. If you stay at a resort in the center of the bay, you can walk along the beach or the road lining the beach for some light exploring. Taxis are easy to find and Mai Linh Taxi and Phan Rang Taxi have meters. The biggest factor that can negatively affect your vacation to Ninh Thuan is if a large group of Vietnamese stay in your resort. Ask the receptionist when you check in if they expect a large group and ask for a room that is away from them. These company or school trips are usually accompanied by an tour guide/MC with a microphone and large speakers. A banquet with entertainment and karaoke can make dining at the restaurant impossible. If this happens, try going to the beach bar at the Saigon Tourist-Ninh Chu Hotel. Have some beer, good seafood, and relax while listening to the waves. Another option is to go to your restaurant, order, and have them deliver dinner to your balcony. The groups typically go to Vinh Hy Bay for most the day or they move on to another destination. Daytimes at the resorts are almost always quiet and peaceful. Phan Rang is not Ho Chi Minh City or even Nha Trang when it comes to service. Many of the staff speak English, but you are far more likely to have to point to the menu (written in English), and ask the receptionist to tell your taxi driver where you are going than in the more popular tourist destinations. You should keep your expectations low for any spa treatments from the local resorts. The beaches are separated from town, so there are not a lot of convenience stores around, yet. It is possible to find some convenience store items nearby, but if your plan is to stock up on groceries, you may want to take a taxi to the Co-op Mart near Phan Rang. Ninh Thuan Province is very much like the eye of a storm. To the south are the bars and crowds of Mui Ne and Phan Thiet. 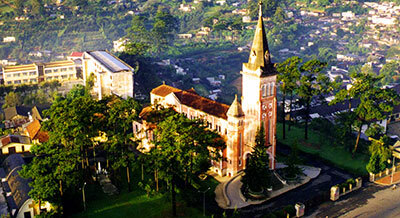 To the west is the increasingly popular mountain city of Dalat. To the north is the beach city of Nha Trang. If you are looking to step out of the storm that is Vietnam tourism and see what Vietnam is like when foreign tourists are not present, then maybe you should try Ninh Thuan Province. You might want to hurry, though, as this hidden gem is becoming discovered. Tết Nguyên Đán, or simply Tết, is the most celebrated and important holiday in Vietnam. Tết rites begin with Ong Tao, one of a group of omniscient kitchen gods named Táo Quân, hand-delivering a report to the Jade Emperor in Heaven about affairs in the family home. It is widely believed that this report affects family destiny or extends or shortens life spans according to actions over the course of the previous year. Ông Táo’s report keeps him in Heaven for six days until he returns home in the night between the old and the new year. Most merchants close during Tết celebrations, so people try to stock up on supplies, food, clothing and home decorations. The streets and markets are crowded with people in the days before Tết and then deserted during the festivities. Tết takes place on the first day of the first lunar month (late January/early February), a special day when the souls of ancestors return to earth. 2016 is the year of the monkey. The lunar calendar years are named after animals: rat, ox, tiger, cat, dragon, snake, horse, goat, monkey, rooster, dog and pig. 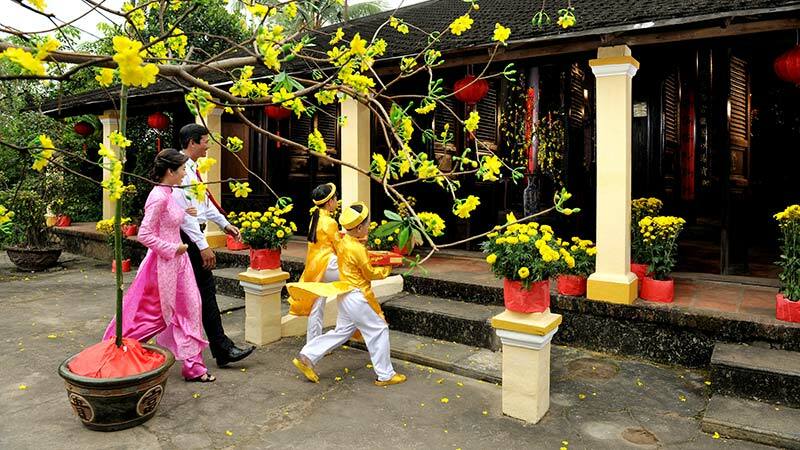 The first day of Tết is reserved to the core of the family. 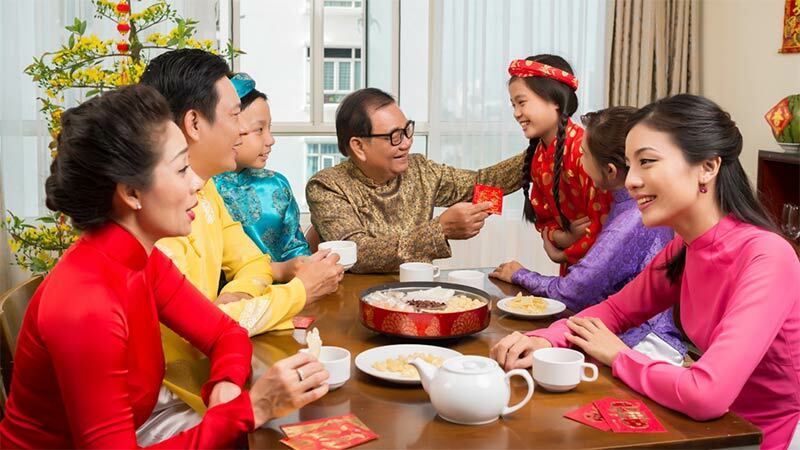 Children receive a red envelope called lì xì (or 'lucky money') containing money from their elders. To bring good luck, cash bills must be new and free from bends or rips. As for adults, it is customary to offer various gifts of wine, biscuits, sweets or jam. 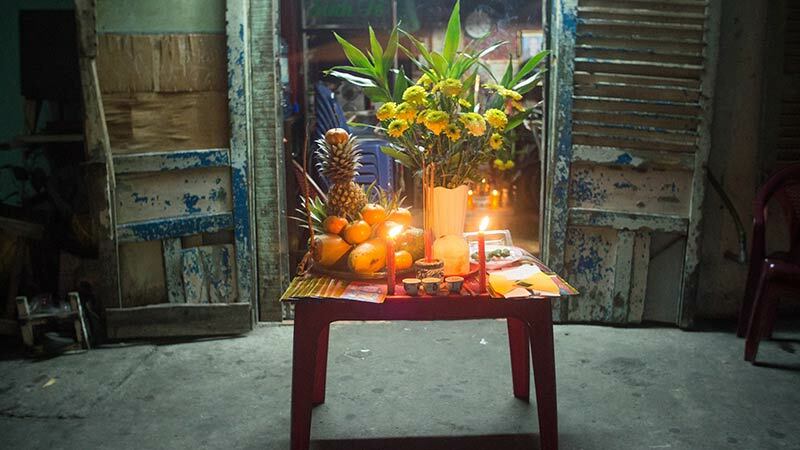 Vietnamese families usually have a family altar to honour their ancestors. 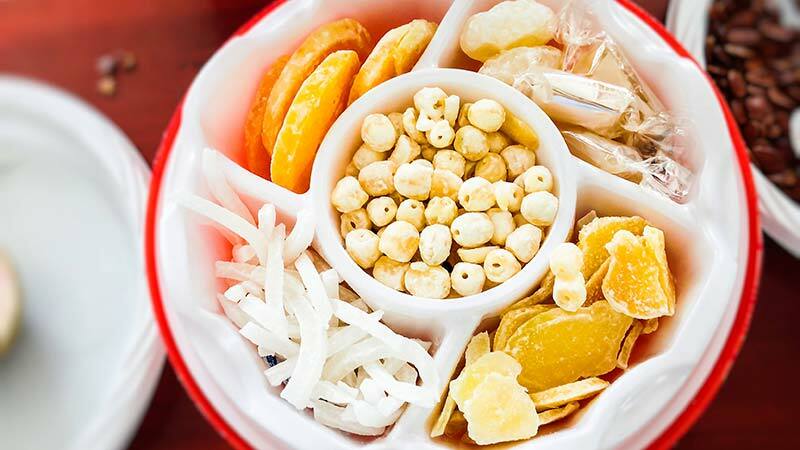 Upon this they will place a tray of five different fruits called mâm ngũ quả. During Tết, the altar is cleaned and new offerings are placed. As Tết is the time to welcome family ancestors, one’s house must be thoroughly cleaned to make it as welcoming as possible. When welcoming visitors on Tết, vigilance is essential. It is believed that the first person to visit one’s home on Tết will bring either good or bad luck to a family for the following year. Thus, a rich and respected visitor would bring happiness and good fortune while the converse is also true. Home decoration is an important part of Tết festivities. The house is believed to be protected against evil spirits by a kumquat tree, which symbolises fertility. 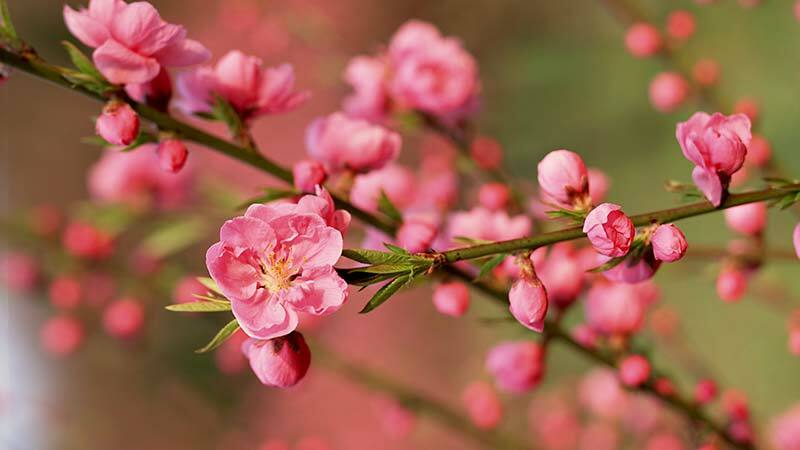 In the north part of the country a branch of pink peach flowers called hoa đào is displayed. 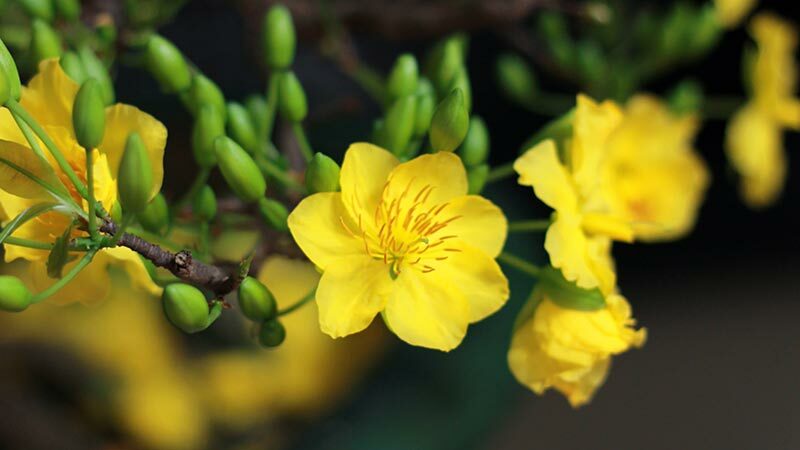 In central and southern regions branches of golden apricot blossoms (hoa mai) are used. Bright colours are worn to attract good luck in the coming year. Bánh chưng is a square, steamed cake, an indispensable dish of Tết. It was invented during the Hùng King Dynasty and is rectangular to symbolize the Earth. 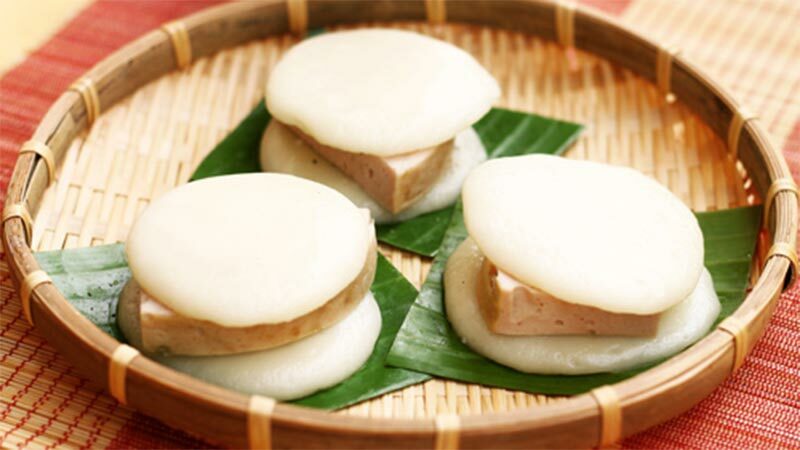 This cake is made ​​from glutinous rice, mung beans and pork, and wrapped in banana leaves. All families place bánh chưng on their ancestral altar as an offering. Bánh dầy, with its circular base of glutinous rice, symbolises Heaven. With these two cakes, bánh chưng and bánh dầy, Vietnamese pay homage to ancestors and Heaven and Earth. Boiled or steamed chicken plays an important role during Tet meals. Indeed, all meals that pay tribute to ancestors must indeed contain a boiled chicken. The chicken is served with sticky rice and bánh chưng. Xôi is glutinous rice of several types. Xôi gấc is one such type that is preferred by many Vietnamese for its red colour – red symbolises luck. This sticky rice is usually served with cooked chicken. Mứt is candied fruit and Mứt Tết is a Vietnamese jam served with tea. This jam, in its dry form, is always kept in beautiful boxes and placed on the table when serving tea. Finally, during Tết, Vietnamese stay polite and smiling, under the watchful eyes of three statues (Phúc, Lộc and Thọ) representing happiness, prosperity and longevity. The main greeting at Tet is, ‘Chúc mừng năm mới’, which translates to ‘Happy New Year’. 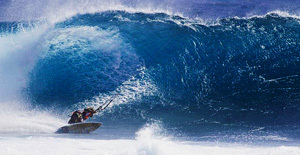 Kitesurfing equipment has become safer and more durable over the last years. Still, it’s quite possible to damage the kite or the board. During the high season in Mui Ne, waves can reach two meters height and the wind is strong with 25 knots. In these conditions, a kite falling into the water might get damaged by the energy from the ocean or the wind. When the kite crashes in the water, the fabric may stretch to the point where the seams break. This is an easy repair, and usually this is done with a old-fashioned sewing machine and special repair tape, called rip-stop. A kite repaired by a professional, will fly like new. Sometimes, the “bladder” (inner tube) which holds the air to stabilize the kite, may have problems. Sometimes bladders leak air due to a small puncture. This can be fixed with repair tape, not unlike fixing a flat tire on the bicycle. Other times, the bladder might have more damage, it can even explode when it’s pumped to hard. There, the only solution is to replace the bladder, and good kite-repair shops will have bladders in many sizes in stock. The lines and the bar which is used to steer the kite, can also get damaged. Lines can stretch from, for example, jumping, or simply due to the power of the wind, or they even can break. Experienced kite-repairers are able to shorten stretched lines, but broken lines have to be replaced. Other parts of the equipment, like the bar or the “pulleys” (which is the attachment between the lines and the kite) may break, in particular given the salty water in Mui Ne. In those cases, it’s best to just replace the damaged equipment. Kiteboards are rarely broken. In Mui Ne, there are no stones or corals which present a danger for the boards. The only exception may be “surfboards”, which may break due to high jumps. Depending on the amount of damage, surfboards may not be suitable for repair. In Mui Ne, there are a number of specialized kite repair shops. One of the more established kite-repairers is Frenchman Christian Bouillon who works at the Kitesurf Ananda Shop. Christian is probably the most experienced in this profession: in his his native France a professional sailmaker. There are also a number of local kitesurfers who have the necessary skills to repair kites. They usually work at any of the many kiteschools during the day. It turns out that most damage is done by novices of kitesurfing, and kiteschools are probably the biggest customer of any kite repair shop. 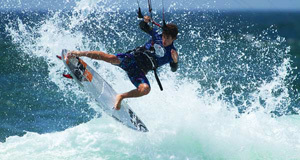 The best prevention for any damage that may occur is to take good care of the equipment (rinse the bar and lines and the board with fresh water after a kite session, for example), and not to leave the kite on the beach in the wind and sun during the entire day, and to be be careful in high waves. "City of Eternal Spring", Why not? Dalat is the stepping stone to the Central Highlands of Vietnam. It stands at 1475 metres and this French influenced city is a breath of fresh air after the mayhem and humidity of Hanoi and Ho Chi Minh. Dalat has been known for decades as the "City of Eternal Spring". This is due to its year round cool crisp mountain climate. Dalat is the centre for vegetables and flowers, which grow in abundance in the rich, dark colored soil. Golfwise, it is well serviced by three golf courses, although two are only nine holes, with both scheduled for completion of 18 holes this year. 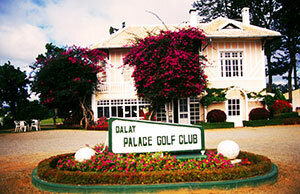 In 1994 Dalat Palace Golf Club emerged again as the ideal golf retreat in Southeast Asia. The 18- hole golf course is crafted into the area’s rolling hills, surrounded by stately pine trees and seated above the majestic lake Xuan Huong.. The course weaves its way through stately pine trees to oversized and delicately manicured bent grass greens. For many years it has been rated as the best golf course in Vietnam and many would tell you that it still is. Located about 15 minutes drive from the airport, Royale City Golf Club, whilst only 9 holes is an absolute gem of a golf course. Some of the views will take your breath away and the par three third hole, with its 80 metre drop from tee to green is just stunning. Designed by Peter Rousseau, his concept is to keep the site as natural as possible, preserving the beautiful trees, some of the paddy fields and other water features. At the same time, enhance it with more exotic flora and fauna and to utilize the many natural springs, waterfalls and smaller lakes. The latest addition to Dalat is Tuyen Lam Golf Club and Resort, situated halfway up the mountain heading into Dalat City. The resort is located by the beautiful Tuyen Lam Lake, right outside of Dalat town. The valley topography is surrounded by sloping hills and primeval pine forests. 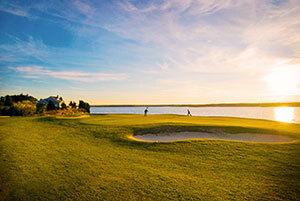 18 holes are planned to be completed by April 2104 and nine holes have been opened since February 2013. The heart of the valley is a natural high mound which is a highlight for the formation of a four-star hotel, a golf clubhouse and next to it is the driving range. Halfway is a winding path following the slope of the hill. You can feel a combination of high-level works among the pure natural hills by standing anywhere. http://www.sacomresort.com.vn/. Dalat is highly recommended not only for the magnificent golf courses, but also a wonderful and relaxing place to visit. With its mountain setting, the temperate weather is usually warm to hot during the day and cool during the evenings. There is no need for air conditioning. The rainy season lasts from May to October, and the dry season is from November to April. The wet season does not prevent golf, as the rain is not continuous and many days are dry. One word of warning! Due to the high altitude, the sun’s rays are much stronger; therefore use plenty of sun lotion to avoid getting sunburn. There are many hotels and resorts in Dalat, from five star to one star and therefore accommodation is plentiful and built in a French style. There are many restaurants and cafes offering interesting local and international cusine. There is an international airport, with regular daily flights from Ho Chi Minh, Danang and Hanoi. For visitors on a budget, sleeper buses from companies such as Sinh Café. Be warned that is it about 7 hours from Ho Chi Minh to Dalat. BEWARE. The usual charge for the 35 kilometer journey from the airport to Dalat centre is around 300.000 Vietnam dong. Do not use the meter if you are using a taxi. You can buy a ticket from the taxi booth inside the terminal. 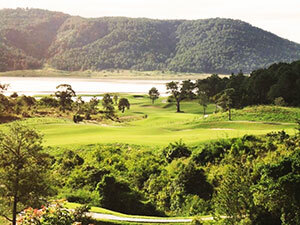 Golf Asian – www.golfasian,com - and Golf Dalat – www.golfdalat.com – specialize in booking golf trips to Dalat. They can book not only tee times but also accomodation and make all travel arrangements as well.